Link assets are ideal for adding web links to your guides. Because Link assets are stored in your assets library, once someone creates a link it can be reused over and over in other guides. Plus, unlike adding links inside of a Rich Text/HTML content item, Link assets provide statistics on the number clicks they receive throughout your guides. Avoid using Link assets for linking to your library's research databases. You should instead reuse the Database assets added to the A-Z Database List by your Admin. While editing your guide, click on the Add / Reorder button at the bottom of the box where you want add this. Select Link from the dropdown menu. Give your link a name in the Link Name field. This is what display's as the text of the link (i.e. what users will click on). It's also how the link will be identified in your assets library and statistics. In the Link URL field, enter the full URL of the page you're linking to (including the http:// or https://). Use the Window Target field to select whether to open the link in a new or the current window. If proxy authentication is required to view the link (e.g. a link to a journal article), set the Use Proxy setting to Yes. If you would like to add a description about the link, enter it in the Description field. You can also enter additional details about the link in the More Info field. To customize how the description appears on the page, choose your preference from the Description Display options. 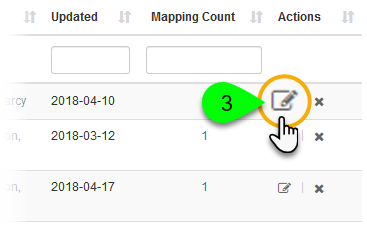 If you would like to assign your link to a subject category, click on the Subject Associations tab and select the subject(s) to assign. This will allow you to filter your assets by subject in your assets library. It's always best to reuse existing assets as much as possible. This will help reduce duplication in your assets library, while also making it easier to analyzing statistics for a particular asset. In the Add Link window, click on the Reuse Existing Link tab. In the Search for Link field, start typing in the name of the link you want to add. Select the link you want to add from the list of results. A summary of the link info will appear. Not the link you are looking for? No problem: search again and select a different one. By default, a mapping of the original link will be added to your guide. If you would rather create a copy of the original link, select the Copy checkbox. Using a mapping is convenient because any changes made to the original link will automatically be reflected on your guide. The drawback of mapping is that you won't be able to edit the link yourself (except for adding a custom description just for this one mapping). If you need to customize more details of the link, then select the Copy checkbox. This will create a standalone copy of the link that you own and can fully customize. To manage a link, click on the its Edit () icon. 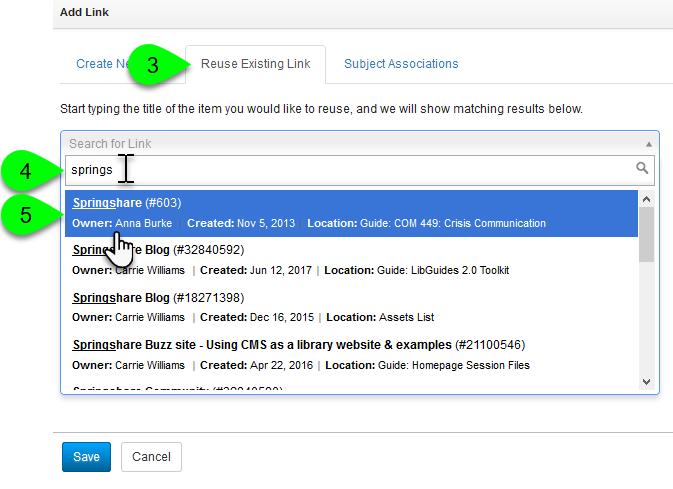 To add another link to this asset group, select Add to Group and follow the steps above to create or reuse a link. What's a group? 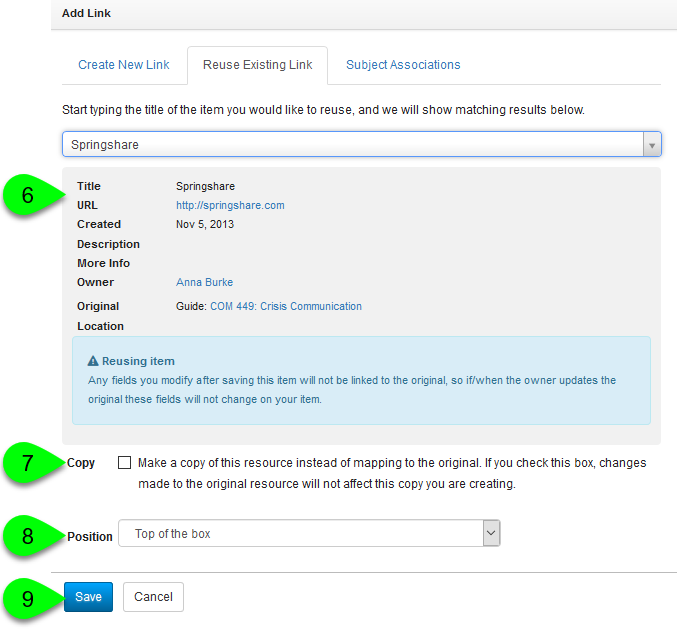 When you add links next to each other in a box, they will automatically form a group. 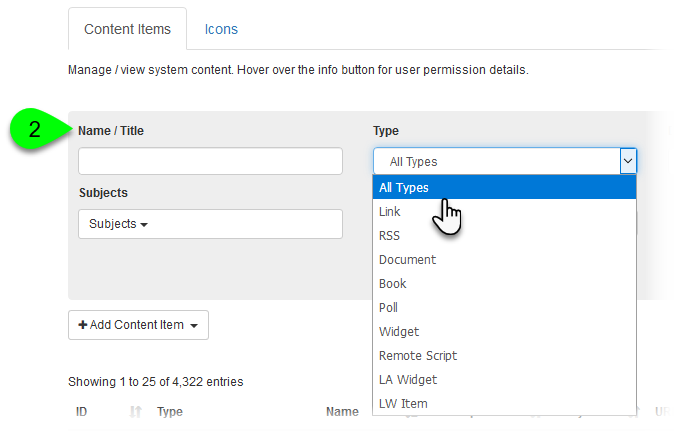 Links in a group can be sorted by title; plus, when reordering content, you can move the entire group at once instead of each link individually. To customize the link's description, select Edit. If this is a mapped asset, please note that this will only apply to this single mapping of the link. It will not affect the original link's description. To remove the link from your guide, select Remove. This will only remove the link from your guide. It will not delete the link from your assets library (Content > Assets) and can still be reused. 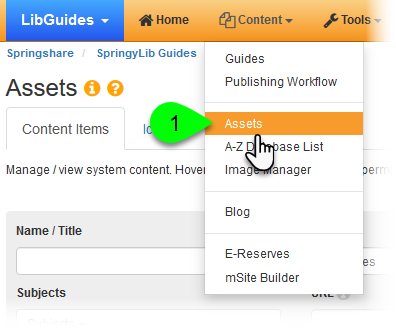 The assets library is where all reusable assets are stored in your LibGuides system. From here, you can centrally manage your assets, as well as create new ones. Admin users can edit any asset in the system. 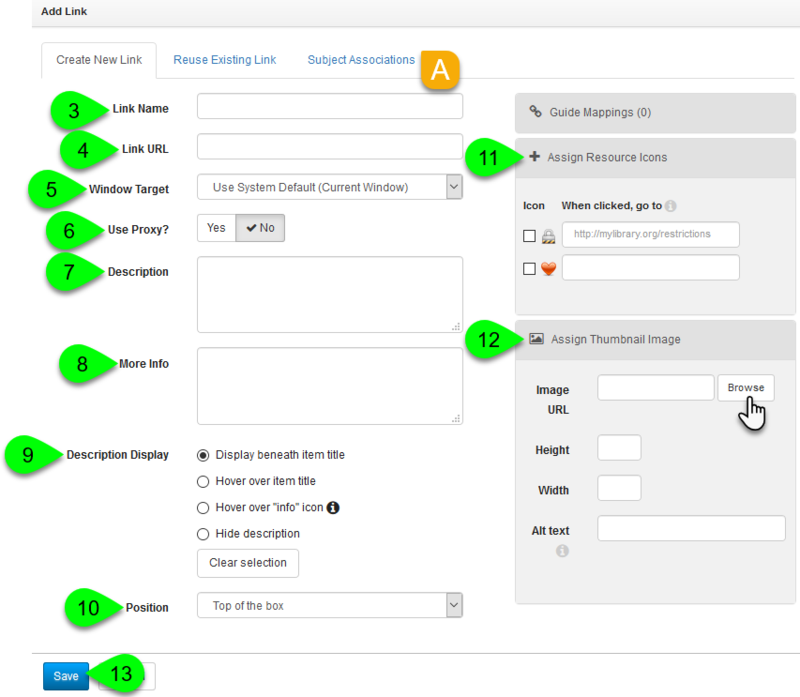 Regular users with the Manage Assets permission (CMS only) can also edit any asset. All other Regular and Editor users can only edit the assets they own. Use the filters at the top of the page to filter the assets library (such as by type or owner). To edit a link asset, click on its Edit () icon in the Actions column. Changes made to the asset will be reflected everywhere the asset is being used. The only exception is if a mapping of the link is using a custom description. In that case, the custom description will continue to display on that guide.